This focus of this article is the fate of the cultural narrative that has most influenced Estonian culture of the 20th century – Young Estonia. The point of departure for the analysis is Tiit Hennoste’s 2005 essay ”Young Estonia – An Unfinished Project for Self-Colonization”, which I interpret as the interruption of Young Estonia’s ”great narrative”. Hennoste’s demythologizing approach should be regarded in the context of postmodernism (or of postcolonial treatments of literature and art). I argue that the fact that Young Estonia’s models for cultural movements were located in Europe did not automatically lead to the assimilation of 20th century Estonia (literary) culture. Neither did they engage in an automatic copying of European culture; their activities might better be regarded as a process of intertexual enrichment. In what follows, the fate of the narrative of Young Estonia will be traced both in terms of the literary field of Soviet Estonia in the 1950s and 1960s, and in exile. I claim that renewed awareness of the narrative of Young Estonia can be traced to the publication of a collection of Gustav Suits’ Poems in 1959, edited and with an afterword by Endel Sõgel. If one lowers the volume on the vulgar Soviet ideologization in Sõgel’s text, key words that characterize the Young Estonia canon remain in place undisturbed: innovativeness, intellectual greatness, turning point, the social nature of art and literature, consonance of the aesthetic and the ethical. Sõgel’s framing of Young Estonia stands in contrast to its apologetic treatment in the postwar Estonian diaspora. On the one hand, this line of interpretation follows the basic outlines of a critical narrative that developed in the 1920s; on the other, since most of Young Estonia’s authors and followers among the Estonian literary elite had gone into exile in 1944, diaspora interpretations represent a definite literary-political position. In the 1960s a new generation takes it cues from Young Estonia’s narrative, the connecting link between Young Estonia and the 1960s is the work of young poets from the end of the 1930s, Arbujad (the Logomancers). In this context, the author of this article comments at some length on Jaan Kross’ connections with the narrative of Young Estonia. 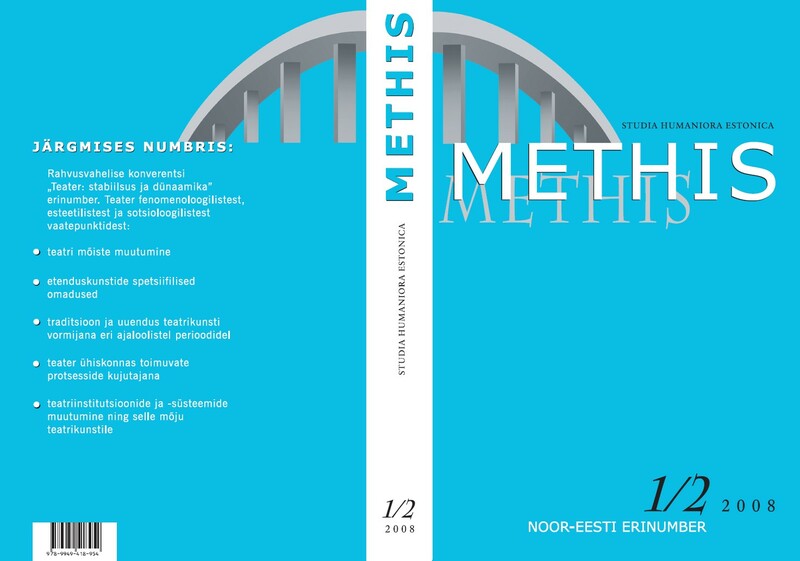 The last third of the article discusses the motives and milieu in which Young Estonia’s narrative was generated, and shows how, over a period of 10 years, Young Estonia developed its assertive autonarrative into a cultural model – a metanarrative.